In this solo cooking adventure, Gary makes a messy but really tasty sandwich. 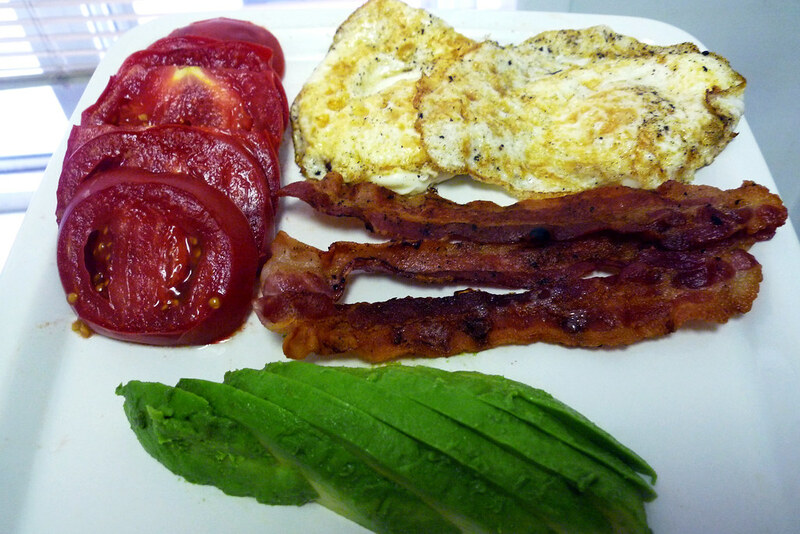 Turn it into a TABLE: tomato, avocado, bacon, lettuce, and egg. You’re welcome. That sounded like a really good idea so a few days later, after a quick trip to Whole Foods for eggs and an avocado, I set out to make a TABLE. Only one problem – I had used the last of my lettuce for the previously mentioned BLT. So instead of making a TABLE, I would now have to settle for a BEAT, not that I was really complaining. We are, after all, talking about a sandwich with bacon, heirloom tomatoes, avocado, and eggs – is the lettuce really all that important at that point? The best thing about making a sandwich with bacon? Well, if you cook the bacon first, all that lovely bacon grease can be used to cook and heat up the remaining ingredients. After the bacon finished crisping up, I reserved the rendered fat to cook the eggs over-easy and then brushed some onto each half of split ciabatta loaf before toasting. 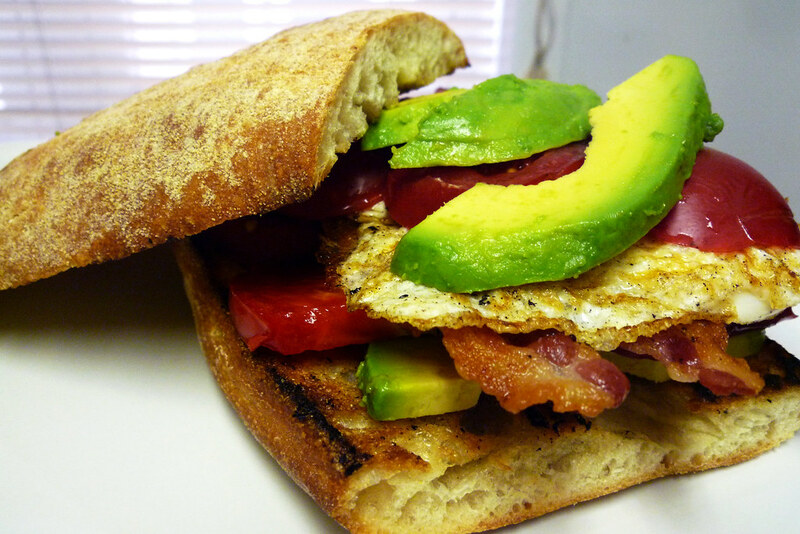 Once the bread’s done toasting, all that’s left is to layer the bacon, tomatoes, avocado, and eggs onto one half, place the other half on top, and then eat. The egg yolks will break once you press the top half of the loaf on top but with any luck, it’ll stay between the two halves of the bread and not too much of it will leak out. I lost some yolk but there was plenty left to make it a messy but decadent affair. Cook the bacon in a pan until desired crispness. Pour most of the rendered fat into a bowl and reserve for later use. Leave some in the pan to cook the eggs. Cook the eggs over-easy (or over-hard if you don’t want runny egg yolks). Slice the ciabbata loaf in half. Brush each half with the rendered bacon fat and sprinkle salt, to taste. Toast each half of the loaf on the greased side until browned. 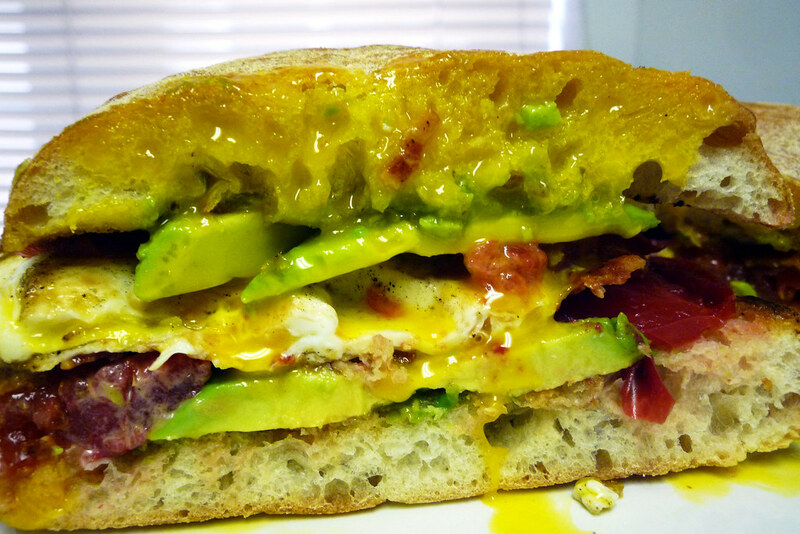 Layer the bacon, tomatoes, avocado, and eggs onto the bottom half of the ciabbata. Add black pepper, to taste. Put the top half onto the sandwich. Press lightly to break the yolks.